Search our waterfront vacation rentals in Alabama & Florida for rent, let us be your guide in finding the best place to spend your next vacation! 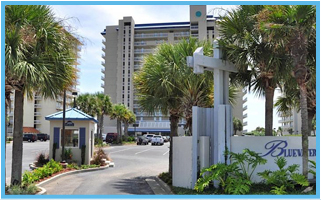 We offer a wide variety of Gulf Shores, Orange Beach, Foley, and Ormond Beach Condominium Vacation Rentals. Come stay in one of our spectacular luxury suites and enjoy a quiet getaway waterfront vacation rental with great views, relaxing natural surroundings, and endless wildlife. Experience our Wolf Bay Landing waterfront vacation rentals. Are you looking for a beachfront vacation rental in Alabama? 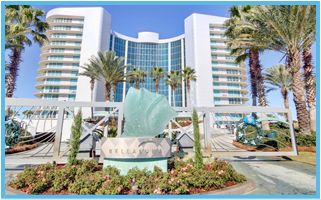 Make a reservation in one of our Bluewater Condominium vacation rentals in Orange Beach right in the center of everything, such as shopping, dining and night life. The Court of Palms; a small but pleasant pool, two barbecue areas with a soothing melodic rock fountain, all surrounded with decking for sunning, playing cards, alfresco dining, reading and just relaxing. Come experience our comfortable waterfront vacation rentals in Alabama located on beautiful Wolf Bay! All of our luxury condos come with spectacular views, natural surroundings and a quiet, relaxing environment. 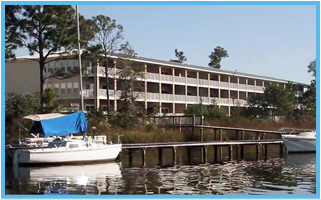 Wolf Bay Landing Condominiums offers 3 piers for fishing & crabbing and tying boats. TRY IT ONCE AND NOTHING ELSE WILL COMPARE! 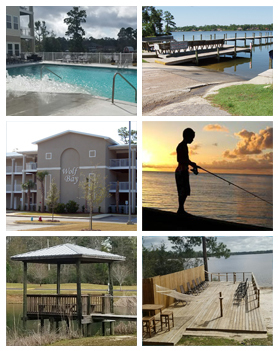 Wolf Bay Condo has a wide variety of vacation rentals available for your next vacation to the Gulf Coast of Alabama. Our condo rentals in Alabama offer two very different types of vacations. Wolf Bay Condo rentals offer both waterfront vacation rentals and beachfront rentals and have the options of choosing from a one bedroom unit to a large 3 bedroom luxury condo. We are Owner operated and managed and work hard to give you the best service possible with attention to detail. When finding the perfect vacation rental property for your stay, it’s our mission to make sure your condo rental is the best one ever. Plan your next vacation lodging at one of our most favorite and raved about Condominiums, the beautiful Wolf Bay Landing Condo Vacation Rental! Come experience our comfortable waterfront vacation rental located on the beautiful Wolf Bay. It’s located less than 20 minutes away from the Gulf of Mexico, and one of the Gulf Coast’s most beautiful bodies of water. Known for its convenient yet serene location and diverse aquatic life, these protective waters have long been enjoyed by fishing and boating enthusiasts, as well as bird watchers who appreciate its true uncrowded beauty. 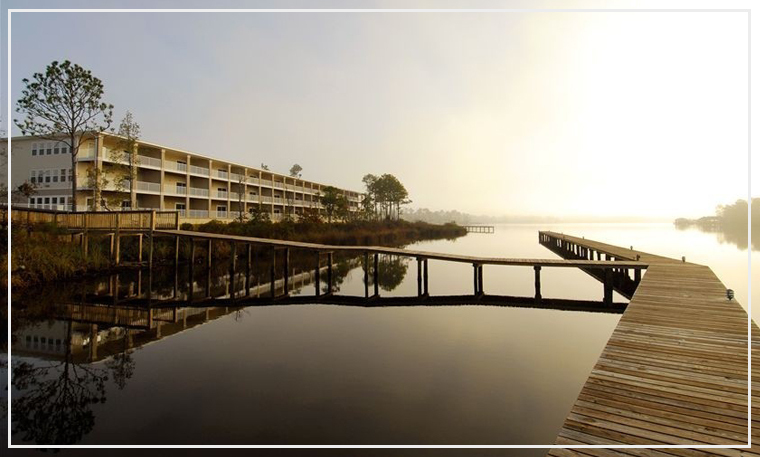 In fact, Wolf Bay has been certified as one of only two bodies of water in Alabama as a National Treasure. Rates are subject to change until reservation is confirmed. 3-night minimum, summer/peak 1-week min. Rates do not include fees & tax. Note: Until confirmed, rates are subject to change without notice. Dates available – Year Round: To access our online reservations calendar, please click on the calendar image below. Bella Luna, which means, beautiful moon, is considered one of the finest properties along Alabama’s Gulf Coast. McGraw Hill voted it Best Private Building in the South East in 2006. Reserve a vacation in the Bella Luna Condo Vacation Rental today with large balcony, patio furniture, fitness center, on-site boat docking, and indoor/outdoor pools. This 3 bedroom, 2 baths colorfully decorated Bluewater unit is located on the 14th floor, at the east end. It has a wrap-around balcony with a direct view of the Gulf of Mexico to die for. Reserve your stay in the Bluewater Condo Vacation Rental and experience all of its amenities including, wrap around large balcony, dining, shopping, miniature golf, nightlife, golf and more. The very name of this small 20 unit, a low profile condominium community, The Court of Palms, aptly describes its serene setting. One side of the complex has views of the Atlantic Ocean from the individual unit balconies. On the other side, a picturesque courtyard. 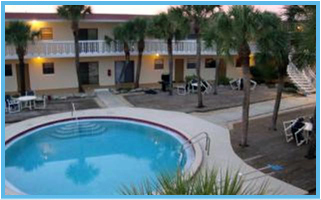 Book a beachfront vacation in the Court of Palms Condo Vacation Rental. This rental offers only Long Term Rentals, which comes with Atlantic Ocean views, outdoor pool, barbecue areas, surround decking, outdoor dining, and a quiet setting. Mexico timeshares can lead to placid reflections by the serene Gulf waters or raucous nightlife. Whatever or wherever your ideal vacation, timeshares can give you the flexibility you need without paying steep hotel costs.